MTZ-Kirovets K744. Photo: MTZ Equipment Ltd. The MTZ-Kirovets Model K744 Tier 4F articulated tractor are returning to the USA and Canada. 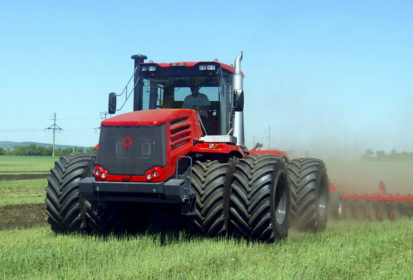 Powered by Mercedes-Benz, Nebraska tested OM470 Tier 4 Final 435 hp engine, MTZ-Kirovets K744 is designed to be good fit for medium and large farms. – 435 hp Tier 4F Mercedes-Benz engine – low DEF consumption. – 16×8 air shifting instead of old style levers. – 74 gpm Bosch-Rexroth hydraulics with fingertip controls. – Solid mechanical design – no complicated computers/electronics/sensors. – Optimal weight distribution (52/48). – Low cab noise, mechanical linkages eliminated. – Extra features as part of standard package: Semi-Power Shift, PTO, differential locks, drawbar rated at 11,000 lbs., 3 pt. hitch, more. – Complete air system included: Air compressor, tanks, hoses, fittings. Handy to inflate tires, blow radiator, attaching pneumatic tools etc. – Easy to service and maintain with basic tools, available on most farms. – 30-inch or 36-inch tracks availability. “Bolt on” tracks, allowing to use same tractor either with wheels or tracks. – Parts support for both the older Kirovets tractors and current models, are available from over 50 qualified dealers across USA and Canada. MTZ Equipment Ltd. is the exclusive distributor in the USA/Canada of MTZ-Kirovets Tractors. Pricing for the Model K744 starts at US$219,600 and will be available in the U.S. and Canada in January 2019.